​Now, Sunday, an easy day, by comparison! As it turned out, it was even easier than I imagined. Blue Cartel. Really, I just liked the name. I thought it sounded just like what I needed on a Sunday afternoon. Blues and laid back Funk. Yep, I'm up for some of that. So, I sashayed along to Quigley's, sartorially resplendent, my finest wine bar attire the latest fashion. I staked out a spot and waited for them to set up. 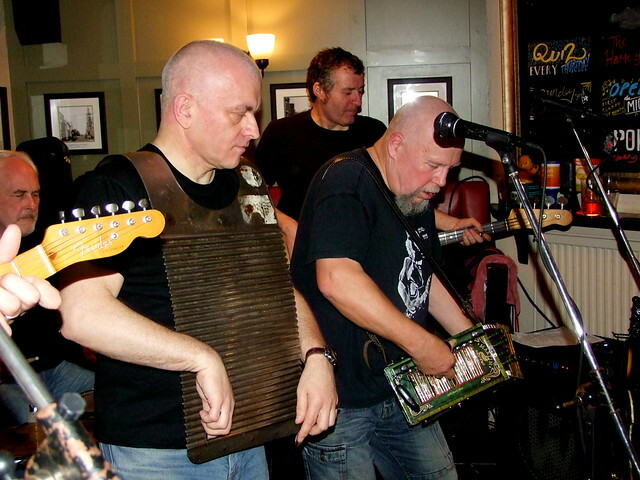 ​Founded in April 2014, Blue Cartel is a four piece Blues/Funk/Soul band. Initially inspired by the John Mayer Trio, the band has evolved through a few line up changes into its current form today. Our set includes plenty of tunes by John Mayer, Jimi Hendrix, Stevie Wonder, Dusty Springfield and many more. We aim to provide an entertaining evening of quality live music, brought to you by performers that love to play live. I used my old-school detective skills, taught to me by Sam Spade, himself, and calculated that we were lacking drums tonight. As it says above, the tunes were by popular artists, but nice choices. I seem to remember a little Bill Withers in there, at one point. Nice sound. Great guitar player, and I loved the bass player dude. He really got into it a few times and it was fun and good to see. Some great interplay going on there between the guitars, really getting something going. The lady singist has a very nice voice and I'd really like to hear this band with drums and some volume. ​From what I saw, this is a great little band. At times, though, I thought they missed the drums, keeping it going but, hey, maybe that was just because they don't normally play as a three piece. I really would love to see them doing a proper set though. Maybe at Jazz & Blues? Who knows? I stayed for Blues Cartel's first set and then, checked my sashay at the door, and moseyed on down to Ye Olde White Lion. As I arrived, they were just finishing off their first set. I had expected to pay a final gig-going visit to The Piano Bar (but, when I got there, the cupboard was bare, as it were. Don't know what happened there.) I encountered The Mighty Vince Cutcliffe, who plied me with Manning Brewers finest ale and we chatted until the band came back, suitably refreshed. I guess swamp'n'roll is a fitting description of their sound. They have the normal bits of band, like guitars and drums but, also, a violin, a couple of squeeze boxes, a washboard, and a couple of other things, that I have no idea what they're called. Their music is, like that of Murphy's Marbles (who I saw, the last event I went to here), subservient to the style in which it is played. Take a song, play it in this style, and it becomes a different proposition, entirely. So, what you are left with is a band playing songs that are all about you joining in, getting involved, and having a good time. That's what this band is about. They do it extremely well and it's very difficult to not get caught up in it. They are a fun band to watch and listen to. Their music is infectious and the way they perform it is engaging. Whilst it's not the sort of thing I would listen to, back in my crypt, on a night out it fits and you have an good time. What's to complain about? ​I stayed for the second set and then, ambled (incapable of maintaining neither sashay nor, mosey) to the Piano Bar for Gregory Murray and The Seven Wonders. An Irishman playing Death Country? What's not to want to see? I guess I'll never know. I got there and it was as empty as Congleton Town Centre at midday on the busiest day of the week. I could have been disappointed but tiredness got the nod, due to its insistence. So, I called it an early evening. Another Unplugged over with. Seemingly slimmed down in terms of acts and venues, over previous years, Unplugged was much more manageable and you didn't feel as though you were missing out on as much. I guess it doesn't help when the venues are closing, either. When is an economy in trouble? When pubs start going out of business. In spite of everything I may say about the town, the council, and The Chronicle, I do like it here. Probably a sado-masochistic streak. Nevertheless, there is a great deal of musical talent in the area and it keeps on going on, even if the local council, government, and other eminently corruptible assclowns do everything they can to kill fun for the common man. Events like this are one of the things maintaining Congleton's tenuous grip on a lifeline. If you don't get out and support things like Unplugged, J&B, and, aye, even Congleton Carnival, and all those bands that play your local pubs, then the town will continue to shrink and Congleton will just become a housing estate, with the closest thing to culture being Curry Night at your local theme pub. Don't let that happen. It was nice to be back for Congleton Unplugged. I enjoyed it and had a lot of fun. It was nice to catch up with a few people and I hope that I can also get back for the Jazz and Blues Festival, later in the year.